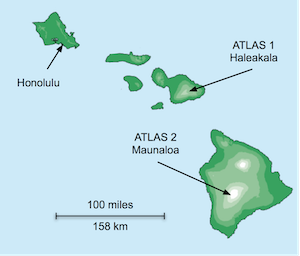 ATLAS is an asteroid impact early warning system being developed by the University of Hawaii and funded by NASA. 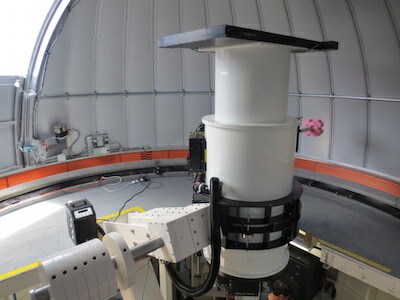 It consists of two telescopes, 100 miles apart, which automatically scan the whole sky several times every night looking for moving objects. ATLAS will provide one day's warning for a 30-kiloton "town killer," a week for a 5-megaton "city killer," and three weeks for a 100-megaton "county killer". View our blog page for the latest news from the team. ATLAS promptly submits observations of new Near Earth Asteroids to the Minor Planet Center, where they appear on the NEO confirmation page. Astronomers all across the world check this webpage every night and collect further measurements needed to calculate the asteroids' orbits and determine if they could threaten Earth. Meanwhile, the Scout Hazard Assessment webpage maintained by NASA-JPL's Center for Near Earth Object Studies interprets the observations using sophisticated computer programs, checking for immediate threats and requesting further measurements of asteroids whose orbits remain uncertain. Both websites are publicly accessible to anyone in the world. ATLAS also processes the survey data to search for stationary transients, which are reported to the IAU Transient Name Server. These include supernovae, CVs, stellar outbursts, and fast transients such as GRB afterglows. We also have an agreement with LIGO to search for electromagnetic counterparts to gravitational wave sources. Our colleagues in Queen’s University Belfast, Harvard, and the Space Telescope Science Institute help run these programmes. We are in the top 3 reporting groups worldwide, with more than 300 supernovae candidates found during 2016. 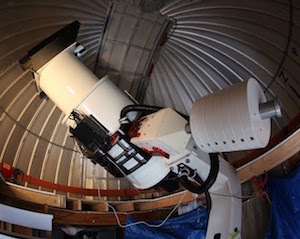 A full list of ATLAS transient discoveries can be accessed here.